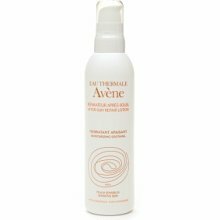 This unctious and fluidemulsion, rich in Avene Thermal Spring Water and vitamins (A, B5, C, E, F), calm heating sensations, moisturizes and restores sensitive skin after exposure to the sun. Its lightweight and non-greasy texture is rapidly absorbed by the skin and helps to prolong tanning. Can be used either on the face or body.